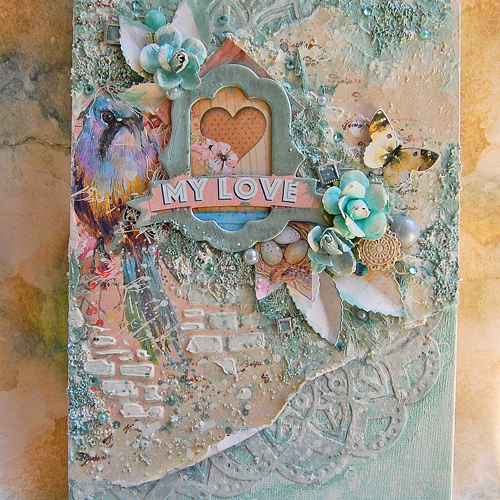 I’m sharing a mixed media canvas with you today. Hello, everyone, Marilyn here and I’d like to show you how I created this canvas with adhesives from wet, Dual Tip Glue Pen, to dry, Premium Double-Sided Tape, that are available at Scrapbook Adhesives by 3L®. Start with paper doilies that I adhered onto the canvas with the Dual Tip Glue Pen. This creates instant textures on the background. Once the doilies were dry I adhered patterned paper to the canvas using Premium Double-Sided Tape 1/4″. Tip: to avoid air bubbles, I started from the top to the bottom. 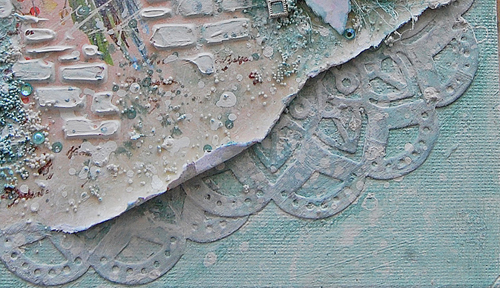 For more texture, I stenciled with modeling paste. 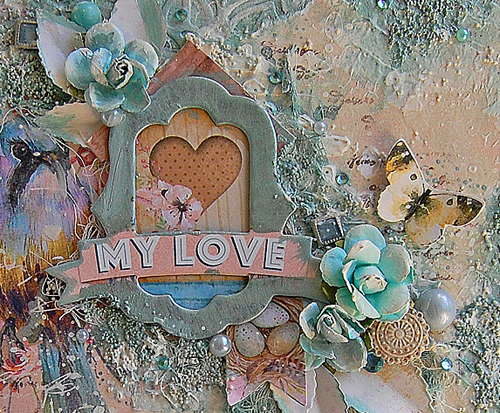 To pop up the “my love” chipboard, I used Crafty Foam Tape in White. Then I added some flowers and buttons that I secured with Dodz Adhesives Dots Medium. With the Dual Tip Glue Pen, I gave the canvas more textures adhering 3D powder randomly. Then I painted with a light blue acrylic paint. For the final touch, I adhered some gems with the Dual Tip Glue Pen. I hope you find some inspiration. Thanks for stopping by, until next time! This entry was posted in Adhesive Dots & Lines, Adhesives, Canvas, Crafts & Tutorials, Crafty Foam Tape, Home Decor, HomeHobby by 3L, Mixed Media, Other Adhesives, Premium Double-Sided Tapes and tagged Adhesive Dots Medium, Canvas, Crafty Foam Tape White, Dual Tip Glue Pen, Guest Blogger, Guest Design Team, Guest Designer, Home Decor, HomeHobby by 3L, Marilyn Rivera, Mixed Media, Premium Double-Sided Tape 1/4". Bookmark the permalink. 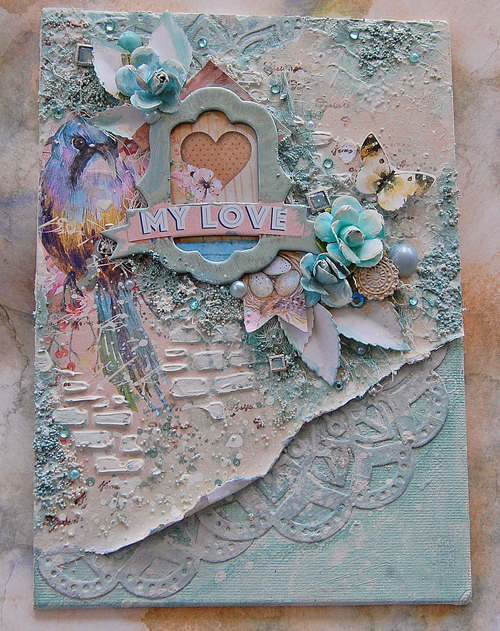 2 Responses to "Creating a Mixed Media Canvas"
That’s a great creation, I love the texture and the dimension with mixed-media.